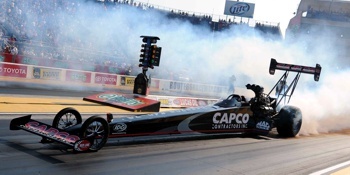 December 19, 2012 -- As the holiday season nears its Christmas and New Year’s celebrations, thoughts of nitromethane-gulping engines and three-second laps on 1,000-foot race tracks are filling Steve Torrence’s Top Fuel racing shop in Brownsburg, Ind. with anticipation. Torrence and crew chief Richard Hogan have been making their lists of parts and pieces necessary for the 24-race 2013 NHRA Mello Yello drag racing campaign as they prepare for pre-season testing that begins Jan. 14 at Palm Beach, Fla. High on the ordering lists were plenty of clutch discs, cylinder heads and engine blocks. “We have been pretty busy this winter and we are just a few weeks away from running again,” said Torrence. “We are currently in the midst of making the transition to bigger-valve heads and getting them ready for testing. The traditional NHRA season opener kicks off the action Feb. 14-17, at Pomona, Calif.
Torrence’s impressive first season as a team owner included a remarkable three victories in five final rounds, two No. 1 qualifying efforts and a ninth-place finish that provided a solid foundation on which to build for 2013. “I think winning the second and third races was a testament that we weren’t just a flash in the pan, and that we actually were a contender,” commented Torrence. “It boosted our confidence. We did a lot more than we were expected to do as a new team . . . much less a single-car team. He earned his first Top Fuel victory at Atlanta in the sixth race and won again at Englishtown, N.J., and Seattle. He climbed as high as fourth place in the standings before the final six events. “We just kind of fizzled at the end of the season,” he pointed out. “That was just part of being a single-car, first-year team and it just shows that there is a big learning curve out there. “I think we will be well-prepared going into this season. We learned a lot last year and that will definitely help us.